PLEASE HELP SUPPORT THE ORGANIZATIONS WHO HELP SUPPORT US. . .
Jack was so stressed that he refused to eat and drink. Because of kind people like you, this retired racehorse got a second chance at life. Before: Jack had competed in 94 races and earned hundreds of thousands of dollars for his owner. But he took a bad fall during his final year of racing. At 11 years old, Jack was destined for the slaughterhouse. 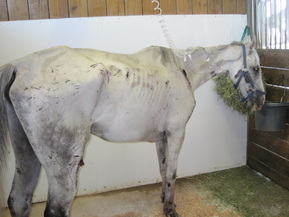 When he was rescued at an auction in Ohio, he was severely dehydrated and malnourished, and had sores all over his body. After: With help from our Second Chance® Fund, Jack received the care and treatment he needed to recover. His rescuers brought him to a sanctuary, where, after a lifetime of grueling work on the racetrack, Jack now spends his days relaxing in a peaceful pasture. Other animals need a second chance. Will you help us heal them too? animal welfare organizations in their vital work. 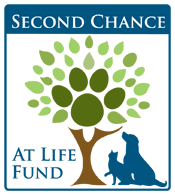 By providing financial assistance to animal welfare organizations responsible for the temporary care of animals as they are prepared for adoption into permanent, loving homes, the program provides animal victims of abuse or neglect with a second chance at life. Visit their website and see all the wonderful things they do! TCA is a charitable organization that provides grants to non-profit organizations that work toward improving the lives of Thoroughbred racehorses and the people who work with them. TCA offers the Thoroughbred industry and its supporters a way to give to one organization while helping many. Their Mission: Through no fault of their own, more than four million dogs end up in shelters and breed rescue organizations every year, and nearly half of them never find a place to call home. Our mission is to help those dogs by providing grants to 501(c)(3) shelters and rescue groups—and by encouraging dog adoption. Visit www.pedigreefoundation.org and make a donation TODAY!! !